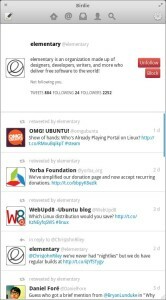 This tutorials shows how to install the beautiful Twitter client on Ubuntu 13.04 Raring, 12.10 Quantal, 12.04 Precise and Linux Mint using PPA. Birdie is a beautiful Twitter client for Linux. It is fast, easy to use and works great. It provides all the basic Twitter features and allows you to enjoy Twitter right on your desktop. Birdie is built by volunteers. All the source code is licensed under the GPLv3 and freely available for anyone to use, modify or share.